In today's daily bread passage, Leviticus describes the burnt offerings which refer to Jesus Christ, the Lamb of God, that is, the Way of (and to) God for life. The offerings represent an aroma pleasing to God. The word 'aroma' or 'pleasing' indicate the relationship, that is, Jesus the Son of God who came to die for our sins and rose for our justification, re-establishes the once broken relationship between God and man. Speaking of this work, Jesus said, "No one can come to the Father except through me." 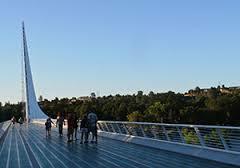 In Redding there is a nice place to visit called "Turtle Bay" where there is a bridge with a modern look. At night the color of bridges neon signs change as in the color of rainbows. Under the bridge there runs the Sacramento River. With the bridge one can cross the River on foot! And today's daily bread presents our Lord Jesus as the Way, the bridge as beautiful as the rainbow reaching heaven! Thank and praise be to God the Father who invites his children to come to Him through Jesus the Son!